When I was a child, I was so quiet that my parents nicknamed me “Mouse”. It suited me perfectly, because instead of speaking up, I was much happier keeping still, burying my nose in a book, and staying out of the conversation. Then I turned 13. Ready to face the world in my Capezio shoes, pleather pants, and a super-sweet, unicorn-inspired Swatch watch, I moonwalked my way into teendom and haven’t stopped talking since. 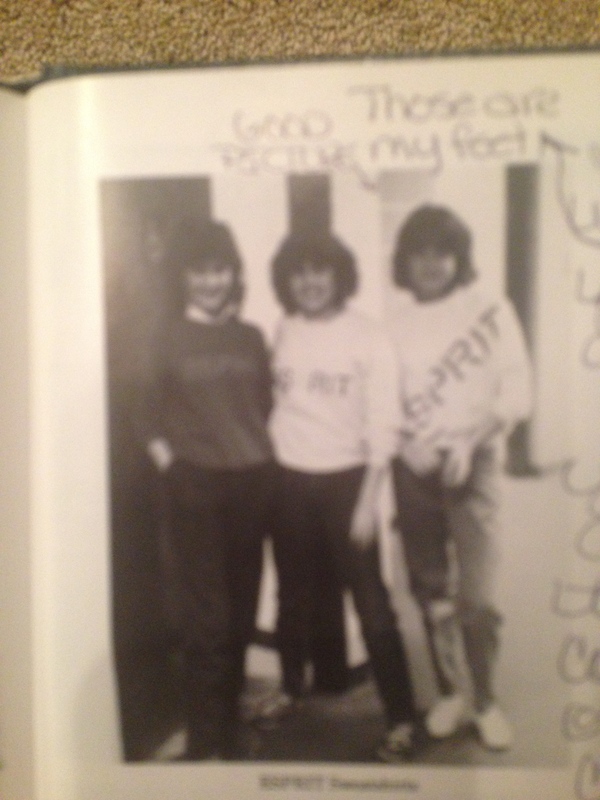 That’s me on the right in my 8th grade yearbook, my bestie Susan in the middle, and my friend Alicia on the left, who had clearly taken the Sunday afternoon modeling class at the mall. Me? Still struggling to look at the camera. Except when I do. Stop talking, that is. Back when I learned that all you had to do to solve Nancy Drew’s problems was skip to the last page, I also unintentionally discovered something else…the value of listening. I was so quiet that conversations went on around me as if I wasn’t there. But I was, and I learned the nuances of pregnant pauses, skipping a beat to absorb a thought, and that, in conversation, it’s O.K. to take a moment to reflect before responding. So the task for Day 13 of the Kindness Challenge is to stop and listen. To everyone…husband, child, stranger, friend. If you’re not sure exactly how to do this, I have a foolproof method for success. Don’t interrupt. When you let someone else’s conversation flow without acting on the impulse to immediately interject your opinion (and, let’s face it, ego), you open a door to true engagement. Everyone wants to be heard, so make that happen today by simply slowing down, pulling back, and letting someone else talk. Sage advice. 🙂 It seems I have been doing more of this just lately. Not surprised Dani! Thanks for the visit and comment. Oh how much on can learn by listening! Of course you can Carrie. I believe you can do anything! I struggle too, in part because I often think my ideas are so important that they have to be heard. Like, right now. I’m actually making it a goal (not a resolution, not a big fan of those), to stop interrupting. Forever. Thanks for the read and comment, Mary! I am certain I should be commenting on the sage advice you are giving and how I am taking it all to heart and am going to spend the evening listening, really listening, to my four lovely children and perfect husband. However, I am too busy obsessing over this picture and wondering why we always thought it was cool to dress alike to listen to anyone. Miss you girl. Fabulous posts Stacie! Love this theme and your insightful writing. So enjoying reading it every day. Merry Christmas!